There has been much discussion over the years over how and why wing paddles are more effective than the old ‘drag’ blades. A common argument is based on the view the wing blade does not move backwards (locking the blade) during the stroke, making it more efficient. The explanation for this ability (to ‘lock’) is that the aerofoil section of a wing paddle makes use of the Bernoulli effect to generate ‘lift’ on the front of the paddle blade, so it doesn’t slip backwards in the water (unlike drag blades, which do). We’ll skip the equation (but feel free to check it out in Wikipedia if it appeals), but we’ll elaborate on the classic representation of the Bernoulli effect creating lift on a wing, as shown below. What is not shown in this typical representation, is what is happening further away from the wing where the air is still at (or near) ‘normal’ pressure. As there’s no physical barrier between the wing and the air at ‘normal’ pressure, a more comprehensive view of what’s going on is shown below. 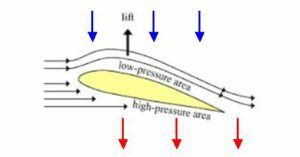 We still have the Bernoulli effect acting on the wing creating ‘lift’, but this also causes the air at ‘normal’ pressure further from the wing to be drawn downwards towards the low pressure area above the wing (blue arrows), and to be pushed downwards from the high pressure area (red arrows) below the wing. This results in the wing leaving a large downward moving mass of air ‘behind’ it, as it moves forward. In the ‘aircraft’ world this is referred to as downwash. It’s not uncommon (if you bother to look!) to find discussions on aviation ‘enthusiasts’ websites arguing whether wings get lift using the Bernoulli effect (sucking themselves up), or Newtonian principles (pushing air down), and there seems to be strong support for both arguments! But a wing ‘sucking’ itself upwards without pushing air downwards simply can’t happen, it contravenes the accepted laws of motion. In this case Newton’s 3rd Law – ‘every action has an equal and opposite reaction’. (Just in case you’re wondering if the work of a physicist born in the 17th century is relevant here- I quote from a NASA educational website –“The motion of an aircraft through the air can be explained and described by physical principals discovered over 300 years ago by Sir Isaac Newton). If it’s good enough for Sir Isaac & NASA, it’s good enough for me! Anyone who has stood near a helicopter taking off will be well aware there is an awful lot of air being pushed very enthusiastically downwards, the helicopter is not simply ‘sucking’ itself upwards due to the Bernoulli effect! So an important point to realise when we’re talking about what the paddle blade is doing, is that water has to be accelerated backwards to propel the boat forward. This isn’t a ‘view’ I’m proposing, it’s a requirement of the laws of Physics. Even with Bernoulli’s help (with a wing paddle), we still need to ‘throw some water backwards’, just as we did in the days of the ‘drag’ blade. As the paddle moves through an angle (when viewed from the side) of 90 degrees or so during the stroke (very paddler dependent), much of it is definitely moving forward, at the same time as some of it is moving backwards! I’ve reproduced the picture in question below (sorry about the quality). 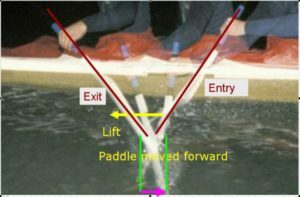 The red lines and yellow text ‘show’ the forward movement of the ‘paddle’ (My interpretation of this is that it is happening predominately above the water surface). I’ve added the green lines and purple arrow to show the blade moving backwards below the surface, roughly pivoting around the shaft / blade join (once the blade is buried). So why is the wing blade more effective than a drag blade? Reading the (American) patent application by the wing ‘inventors’ Stefan Lindeberg & Leif Hakansson, it’s interesting to note that the ‘wing’ technique came before the ‘wing’ paddle. ‘Many present day competition canoeists have transferred to a technique in which the powerful muscle groups of the back are used during increased twisting/rotation of the trunk, and less bending of the arms at the elbow. This new technique results in a greater pulling force and causes the paddle to move further away from the canoe. When seen in relation to the canoe, the paddle is driven in a rearward and outward path’. Lindeberg & Hakansson designed a blade to work better with sideways movement and make use of the Bernoulli effect, but even they stopped short of claiming the blade didn’t move backwards. The present invention relates to a blade which is constructed primarily for this new paddling technique. Thus, when using a blade according to the invention the blade is displaced rearwardly through the water to a smaller extent, and power losses resulting from the formation of eddy currents around the blade are greatly reduced. 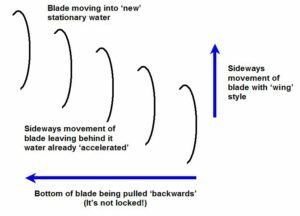 The backward movement of the blade during the stroke is reduced, as a larger mass of water is being accelerated ‘more slowly’ than a similarly sized ‘drag’ blade (due to the Bernoulli effect). The maths of why this is more efficient is covered in ‘The Effects of Blade Size on Performance’. As well as accelerating a larger mass of water backwards (thanks to the Bernoulli effect), the wing paddling technique also means the blade is constantly moving outwards towards ‘stationary’ water (and away from water it’s already started to accelerate). This again results in a larger mass of water moving more slowly than would be the case with the ‘drag’ technique. Note this last feature is a function of the technique, rather than the blade design itself. So I would suggest the wing superiority is partly the ‘wing’ technique, and partly the greater efficiency of larger (or effectively larger) paddle blades.